Our first night in the Sahara was spent at a nomad camp located about 15 minutes out of M'Hamid. It was much more luxurious than I was expecting, considering that it's in the middle of the desert - it was quite large and composed of colorful tents made out of Moroccan carpets. There was a large tent for eating (and later on for music) as well as toilets and showers (although we did run out of water). I guess it gets a lot busier during the other times of the year, but while we were there, there were only about 10 guests (but the camp could probably easily accommodate 50). When we arrived, the sand was really blowing - the scarves we wore were really necessary to keep the sand out of our faces (although it didn't help our eyes too much). We managed to explore some of the dunes around the camp before it started to rain - with lots of thunder and lightning! 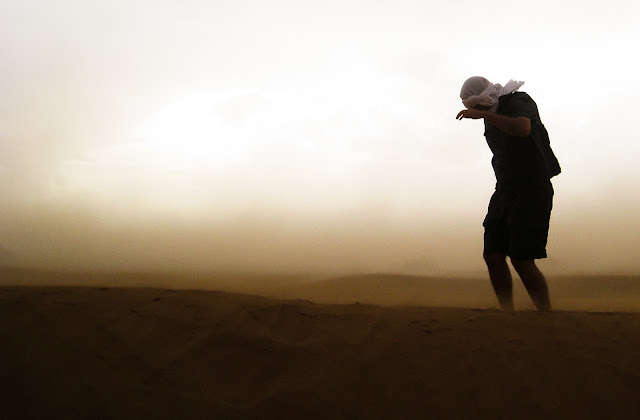 I really loved exploring the dunes and I thought the sandstorm added to the experience. We had dinner and, later on, our guides performed traditional Tuareg music (on the electric guitar and drums). We were looking forward to seeing the stars from the desert - but because of the rain we didn't get to see anything. The next day we departed from the nomad camp and traveled back towards M'Hamid on camel. Laura MyTracks'd the whole trip - you can see the map here. If you zoom in at the start, you can even see our camp! It was pretty neat (and a bit scary) how camels rise from the sitting position - you definitely feel like you're going to fall off. Laura also took a few video from her camel. If you receive our blog by email, I'm not sure how the videos work - you may have to visit the website to view the videos. Entering the oasis - one of our guides is singing! In M'Hamid we were cooked a meal by one of the locals - chicken skewers, bread and a salad of tomatoes, cucumber, peppers and olives -- and of course tea! Down in the south, there's no mint in the tea (mint isn't exactly abundant in the desert), but it I think it's even sweeter - it's sweetened with pieces of sugar that are broken off from a conical sugarloaf. 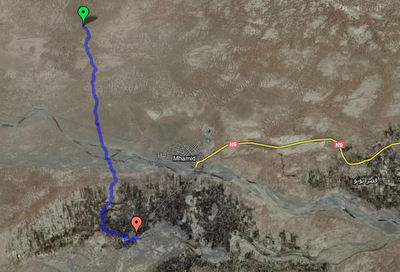 From the M'Hamid we took our 4x4 deeper into the Sahara to Erg Chigaga. Erg Chigaga has some of the largest sand dunes in Morocco. We took some great pictures - but you'll have to wait for our next post!